The Eden Project - office23s jimdo page! 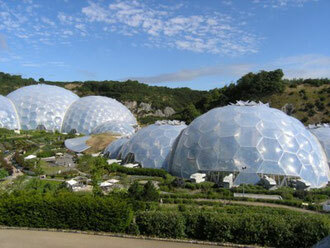 The Eden Project comprises of a number of domes that house plant species from around the world, with each emulating a natural biome. The domes are made out of hundreds of hexagons plus a few pentagons that interconnect the whole construction together; each of these is a transparent cushion made of tough plastic. The first dome emulates a tropical environment, the second a warm temperate, Mediterranean environment. The Rainforest Biome, which is the largest greenhouse in the world, covers 1.559 hectares (3.9 acres) and measures 180 feet (55 m) high, 328 feet (100 m) wide and 656 feet (200 m) long. It is used for tropical plants, such as fruiting banana trees, coffee, rubber and giant bamboo, and is kept at a tropical temperature. The Mediterranean Biome covers 0.654 hectares (1.6 acres) and measures 115 feet (35 m) high, 213 feet (65 m) wide and 443 feet (135 m) long. It houses familiar warm temperate and arid plants such as olives and grape vines and various pieces of sculpture. The Outdoor Biome (which is not covered) represents the temperate regions of the world with plants such as tea, lavender, hops and hemp & sunflowers. The project was conceived by Tim Smit and is constructed within a reclaimed Kaolinite pit where a meandering path offers views of the two biomes, planted landscapes, vegetable gardens and sculptures. The biomes are constructed from a tubular steel space-frame with mostly hexagonal external cladding panels made from the thermoplastic ETFE. The structure is completely self-supporting, with no internal supports, and takes the form of a geodesic structure. The panels vary in size up to 9 metres (29.5 ft) across, with the largest at the top of the structure. The cladding panels themselves are created from several layers of thin UV-transparent ETFE film, which are sealed around their perimeter and inflated to create a large cushion. The resulting cushion acts like a thermal blanket to the structure. The project took 2½ years to construct and opened to the public on 17 March 2001.